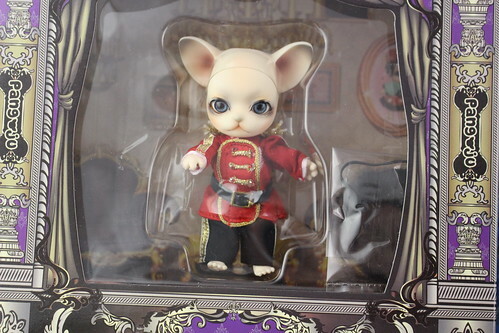 It’s been awhile since I have posted a review here and even longer since I have posted a review of a doll other than a Pullip, in an effort to get things jump started here again I decided to write about the fierce guard dog I recently acquired Darjeeling-pang. 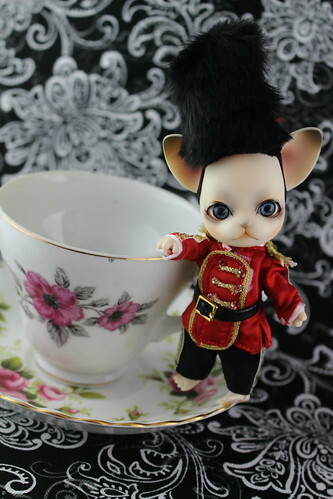 Darjeeling-pang is the ultimate guard dog, having been inspired by the Queen’s Guard who guard the royal residence of the Queen of England. 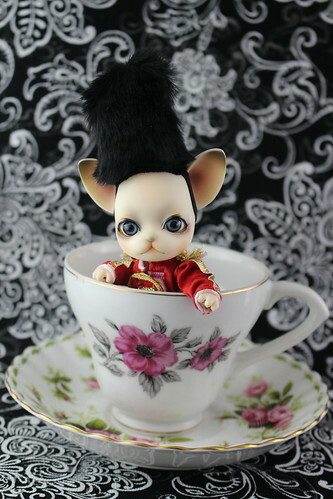 Before I continue, I should probably introduce Pang-ju to those of you unfamiliar with the doll line. What is a Pang-ju? A Pang-ju is a tiny anthro ball jointed doll that are approximately 9 cm tall, they are roughly the same size as a Latidoll Lati White bjd with whom they can share clothing with (a comparison can be seen here). 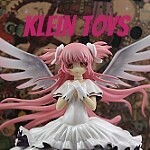 They are made of ABS plastic not resin and are quite inexpensive with a MSRP of only 10000 yen approximately $90.51 as of this writing, which for a full set bjd with face up is quite the steal! Pang-ju are made by the same people who make Pullip. Darjeeling-pang was released in January of 2014. Darjeeling-pang is named after darjeeling tea which is a very popular tea choice in England, tea in general seems to be a lot more popular in England than the US or maybe that is just my perception of it as I don’t really drink tea! 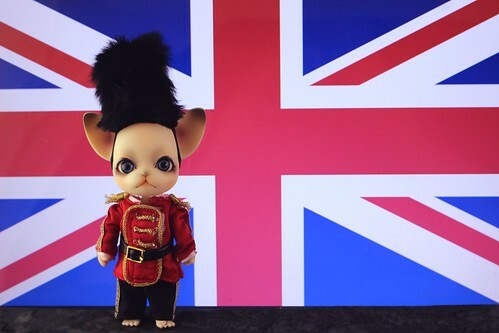 At first, I thought a Queen’s Guard themed Pang-ju to be kind of a funny concept but the Queen of England is a dog lover herself owning several corgis and dorgis (dachshund/corgi crossbreeds) so in a way it makes a strange bit of sense that Pang-ju make the perfect guard dog. I love England, it is second only to Japan on my list of international destinations I would like to someday visit. If I do ever make it to England, I will definitely have to take this little darling with me for any photo opportunities that may arise. While I have yet to travel internationally with my dolls some of my dolls have made the journey without me, my Pullip Cassie visited France this past summer and my Pullip Nahh-ato visited Bahrain, she even managed to bring back a Pullip scale camel back with her (as well as a Pullip sized functional hookah). 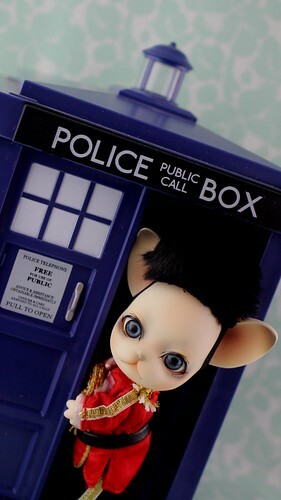 Darjeeling-pang has a wonderfully dark face up, I especially love the darkly tinged ears and smoky eye makeup. I love the contrast of the black and brown tones of his face up with his navy eyes. It seems like the more masculine Pang-ju always seem to have the more done up and dramatic face ups while the feminine ones have much more delicate face ups, you can compare his face up to some of the other Pang-ju face ups on the Pang-Ju face up page (officially halfway done, yay!). Pang-ju Darjeeling-pang in the box, Pang-ju do not come with stands. Darjeeling-pang’s stock consists of a palace guard jacket, pants, a belt and a hat. 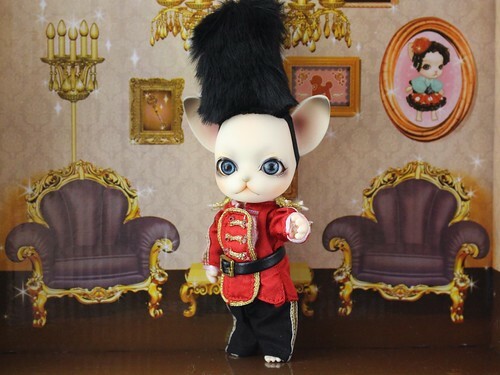 The hat is based off of the tall bearskin hats worn by the Queen’s Guard, it is important to note that the fur that Darjeeling-Pang’s hat is made out of is fake or faux fur. In addition to the stock outfit, Pang-ju also comes with an extra bit of putty for their eyes, they come with a small device installed inside their heads that keep their eyes in place but if you wish you can remove the device and just use the putty to fix his eyes in place. The benefit of using the putty is that the placement of the eyes can be changed much more than the device allows but it can also be kind of fiddly to get the eyes in just right especially since they are so tiny. Personally I would just leave the eyes be in the device unless you are very patient and/or have experience with bjd eyes, I know nothing makes me curse worse than trying to fix something absurdly small on a tiny bjd. I loved that the box liner that is used for Pang-ju doubles as a great little photo backdrop, there are two different designs this one which is used for the more “masculine” Pang-ju as well as a bedroom themed box liner used for the more “feminine” Pang-ju releases which can be seen here with Chiffon Cake-pang. Pang-ju are actually sexless but some appear to be styled as more masculine while others are styled to be more feminine, they can really be whatever gender you want or prefer though. He looks particularly brave and courageous in this photo! Such a darling little doggo! I was trying to think of different British things that would make for some appropriate photographs with Darjeeling-Pang, of course he had to be photographed with the Union Jack! I had asked my husband for other appropriately British suggestions to photograph Darjeeling-Pang with and he asked what the first thing I thought of when I think of England while my answers of Tom Hiddleston followed by corgis were hilarious they were not entirely helpful as neither of which are readily accessible to me at the moment. One of the more realistic things I think of when I think of England is tea! I had to take a picture of Darjeeling-pang with my lone tea cup despite the fact that I don’t really drink tea I have somehow managed to accumulate a questionably large quantity of the stuff including some a friend of mine brought me back from their trip to London. This was just so wonderfully British that I had to use it as a photo prop, it’s just an ordinary police box that is perhaps a bit bigger on the inside that it appears from the outside. 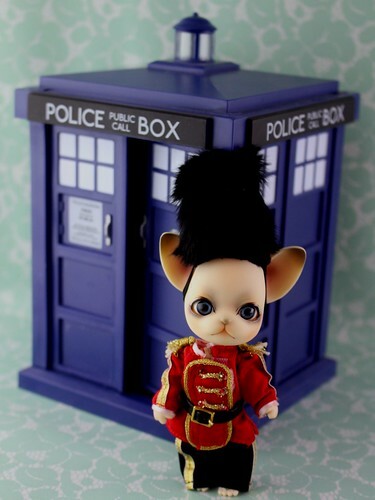 While I don’t regularly watch the show, Mr. Klein as well as the child absolutely love it so we have quite a few Doctor Who toys around the house and the Funko Pop Tardis was just about the right size for Darjeeling-Pang. More photos of Darjeeling-Pang can be seen on my flickr. If you are interesting in reading more about some of the other Pang-ju releases I also have reviews for Black Russian-Pang, Flower-pang, Cranberry-Pang and Milk-Pang that I have previously posted here as well. Well that’s all for now pip pip, cheerio! 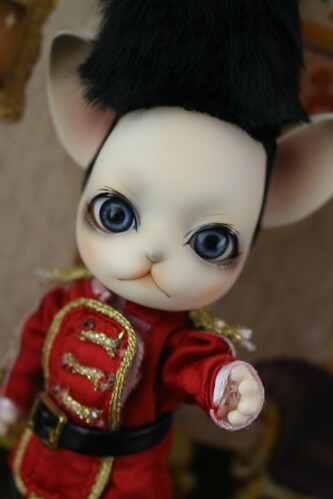 This entry was posted in BJD, Doll, Pang-ju and tagged anthro bjd, ball jointed doll, BJD, darjeeling-pang, groove, pang-ju. Bookmark the permalink.